Unique lock-formed seam and consistent calibrated tolerances combine to product a superior quality product in a wide range of gauges to SMACNA standards. 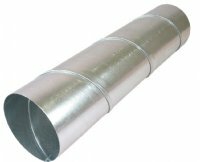 Spiral duct is available in galvanzied, aluminum and 304/316 stainless steel in diameters ranging from 3" to 60". Standard length - 10ft.